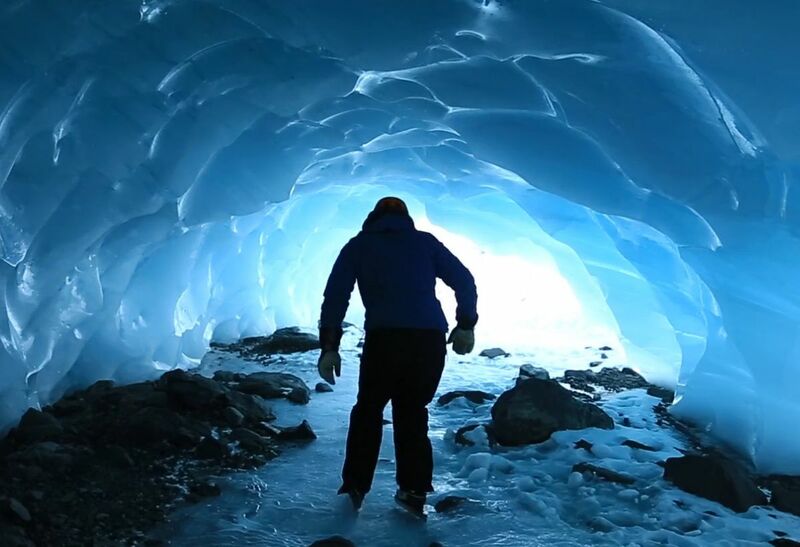 Two filmmakers who captured the beauty of backcountry ice skating in Alaska — in a video showing skaters gliding through ice caves and along glacial lagoons — said they're out to generate interest in the sport. "This is very easy to go out and do, but some people may not have knowledge of how to do it," said Cale Green, a cinematographer. "Part of the idea was raising awareness about this amazing outdoor activity." The three-minute film is called "Wild Ice – Backcountry Skating Alaska." Its soaring footage was often shot by drones, showing skaters weaving past icebergs and snowdrifts along frozen lakes. The footage makes backcountry ice skating appear effortless. In fact, getting to skate locations was often simple, especially the off-highway sites along marshes near Portage south of Anchorage, where families often go, Green said. But Green and web designer Paxson Woelber also ventured far from their Anchorage home to shoot the adventure ice skating, including at frozen Sheridan Glacier lake in Cordova. "It felt Zambonied," Green said of the skating there. Posted on Facebook and other social media Friday, the video had 32,000 views by Monday, with some coming from as far away as Finland, said Green, 27. Southcentral Alaska lake ice is still coming in this winter. Nearly all the footage was shot last year, he said. But the roadside skating near Portage was filmed recently. Dan Mayfield, assembly member with the Matanuska-Susitna Borough, wrote in an emailed statement Monday that Big Lake ice isn't ready for travel yet. "We will get out and measure the ice when we don't see evidence of water. Until then, stay off the ice," Mayfield wrote. The Municipality of Anchorage does not yet recommend skating on city lakes, according to an update Wednesday from the Anchorage Parks and Recreation Department. "Skate at your own risk," it says. Green said he and Woelber, and friends who appeared in the video, did a lot of research on ice conditions before heading out. Much of the information came from groups like the NordicSkate-SouthCentral Facebook page, which has about 600 members. Woelber said knowing how to pull yourself out of a lake if the ice breaks is critical. He and Green carry ice-rescue picks around their necks so they can claw out if needed. They also keep extra gear and clothes in dry bags. Woelber, 33, said the filmmaking project was an excuse to get out and have fun. Backcountry skating can be "sublime," he said. "Skating around an ice track is fun and fast, but it's just not an adventure," Woelber said. "In backcountry skating you can find a channel cutting through trees or along these crazy paths. You never know what it's going to be like."